Rebecca Minkoff always has the cutest bags and this purple mini MAB is no exception. I invest the most in handbags and it is worth it. You can't go wrong with a bag, purple or not, to wear any season or occasion. 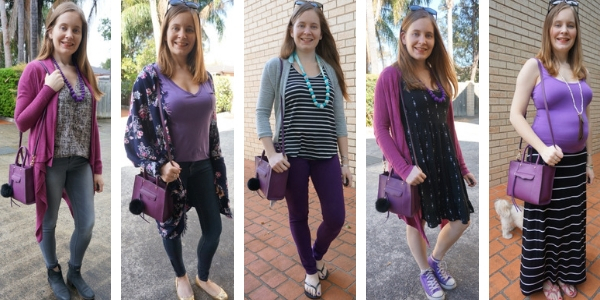 Love all the outfit combinations and I may like the purple on purple way too much! I hope you ha a great weekend and happy Monday! I will always agree that handbags are a great investment, and luckily these go on sale often so aren't too big of a splurge, haha! I love bright bags worn as a pop of colour like that! :) This purple one does it so well! You nailed how to style this chic bag! Every look is lovely. It really still looksbrand new, I am impressed. Not even the color seems to have faded. Do you take measures to protect it, the color I mean? I use a water/stain proofing spray on all my bags (Aussie brand) and it is supposed to help with colour - but I make sure that when I'm not using my bags they are stored out of the sun too. I hadn't heard of the $1 per wear measurement but that's an interesting one! Not a bad idea for truly getting your money's worth out of something. I have a RM bag in a similar color and I love it! I usually use mine as my "pop of color" but I really like it with blue! I guess I better try that next! Thanks Emmy! I justify the splurges by saying they are worth it over the years so it's good to look back on things I buy and see if they are actually worth it, haha! 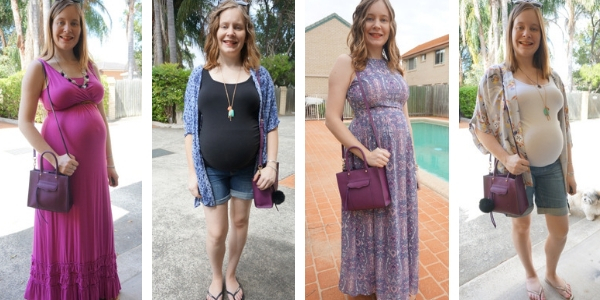 Such a great post and the cutest handbag! You just wouldn't think that a purpleish bag would go with so much, but you've shown how incredibly versatile it's been, Mica. It's one of those colors that works so well for every season!! I love the color;it does with everything. It is definitely a bare-essentials only bag definitely! It's such a great color bag! You'll definitely get it down to $1 per wear! That is such a cute bag. I love the size of it. For some reason, I especially like it with your jean jacket, very hip and cool (my daughter says I shouldn't say "hip"). Have a great week. I love how you showcase all the different ways you have worn your purse. I hope you have a great week. This is my second week back to work. great round up of looks! super cute post! Gorgeous bag and so versatile. Love adding a pop of color! Love your looks! I love post like this that shows that if you really love a product that you should invest in it if you know you are going to get a lot of use from at. I also like how you broke down the cost per wear which is so important in determining if an item is worth it or not. That bag was a great find to be sure and you always amaze me how many looks you can get out of one bag. And I like how you color coordinated the looks in this post. Good job! Have a fantastic day, dear! I love seeing all the outfits at once - it really is fun. You seem to really favour blues, pinks and purples with this (all of which are great! ), but have you tried this purple with greens or yellows? I see you branching out into contrasting colours as your next evolution, Mica. Thanks so much for the ideas Sheila! Other than wearing with a few printed pieces with those colours minorly in it, I've never tried it with more blocks of those colours. I should! You really rock that purple! I don't actually own anything purple?!? I think that I should though. You really make it so versatile with all your looks! 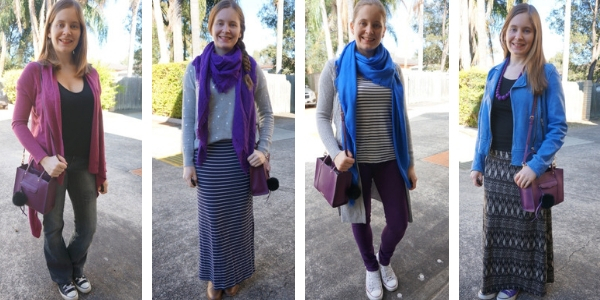 I own a few purple pieces, I think because it goes so well with blue, haha! I love these types of posts. It's great that you were able to get such good wear out of your bag and that it's still in great condition. I love all the looks you paired it with, but my favorites have to be the ones with pink. I just love the two colors together. It's a great bag and looks nice with all the outfits. I always love this boxy Rebecca Minkoff bag because of its shape and hot colour. I can see it is pretty versatile to suit every outfit. May you have a great midweek. That is such a pretty bag! I didn't realize what a versatile color purple is! All of these looks are really cute! It goes with so much in my wardrobe! That bag goes with everything- I'm in looooove! 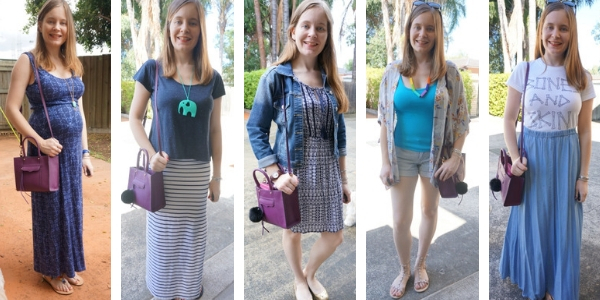 How lovely to see all these great outfits with that beautiful bag! That bag is really beautiful, love the color of it! I like all of these outfits, you styled it perfectly! One small bag but SO many ways to wear it!!! You'll be to that $1 (or less) in no time:) Hope your week has been great! Very beautiful bag and so great inspirations. Have a nice day! Definitely keep an eye out on the sales! I love my Rebecca Minkoff bags! 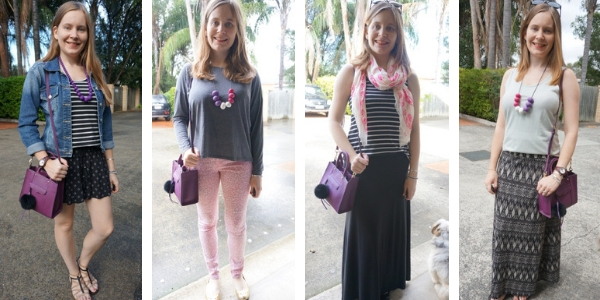 I just love that striped cardi you wore with it and the pom pom accessory! :) I need to look and see how much these bags run. They are so addictive to buy aren't they? haha! What a beautiful shade of purple! It is a gorgeous bag indeed and it's great to see how you styled it in so many ways. I think I like it the most with outfits that also have purple in them. Getting the most wears out of an item is always something we should strive for... fantastic outfits, you always look lovely and fresh. 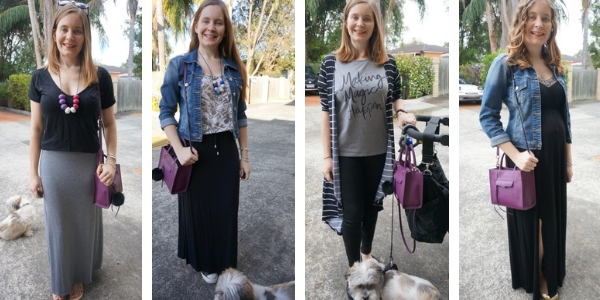 Yes this 30 wears challenge has been good for making me look at different ways to wear things in my wardrobe! That is one of my favorite bags of yours Mica! The color is just so fun. I love all the ways you've styled it, but I think my favorite way is with pink--it just makes such a pretty color combo! I think my first colorful bag was a purple bag. I find that they just go with more than than other bold colored bags. You have definitely proven that! I couldn't even pick a favourite here! I think you wore it perfectly with every look, Mica! I didn't think I would like it with cobalt blue either, but I do! 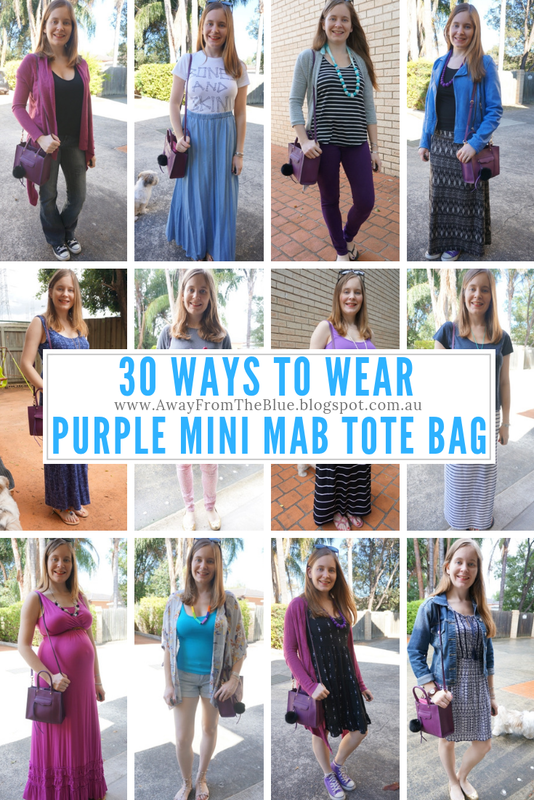 I'm surprised at how much wear you got out of that purple bag, but I love all the outfits! That shade of purple is really pretty and it does go with a lot of different colors and patterns. You're inspiring me to see how much cost per wear I get on the items in my wardrobe. So glad I could inspire you to look at your wardrobe too Kara! The 30 wears challenge is an interesting one to do! It's such a chic and versatile bag. Love how you style it with the neutrals dear, really makes the color pop even more! We're heading to New Zealand and Australia is just ten days so I'm paying even more to your posts Mica! 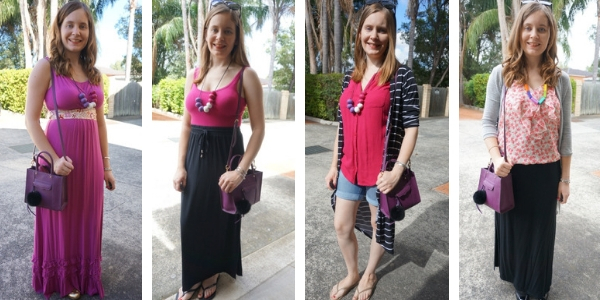 Maxi skirts are a great option, I've not yet graduated from midi-skirts which I have just started wearing so hopefully I can find some maxi skirts that drown me as I'm only 5ft1! Oh so exciting - hope you enjoy your trip! It's definitely warm here at the moment!